madinghana makes THE best 10 list for GHANA! I posted the above poster on the SCRAP SHORT TERM TOURIST VISAS TO GHANA Facebook group page. Join the group and sign the Change.Org petition of the same name. 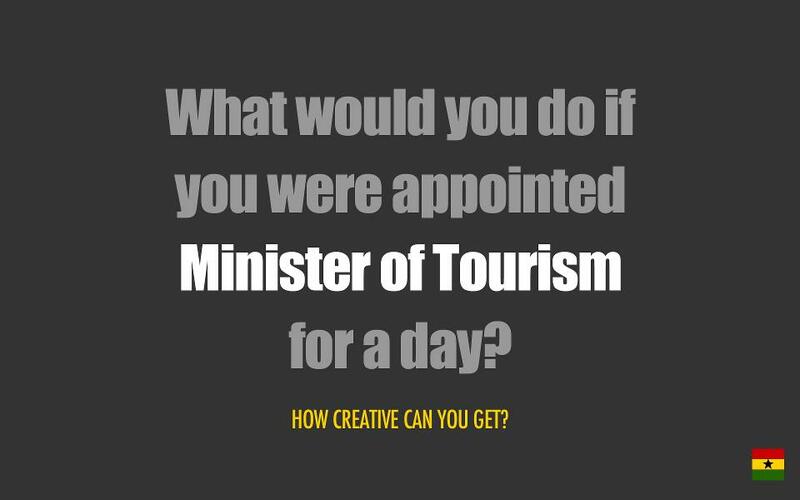 What would you do if you were the Ghanaian Minister of Tourism? Read the comments…..I’ve copied one here for obvious reasons…how touched I was…I got up from the computer on the round table in the sitting room, got to the dining room and sat down and cried…. “Festus Tumi I would highlight the 10 greatest contributions of Ghanaians, both home and abroad,past and present. That would highlight all the positives that Ghana has to offer. 1) Kofi Annan, former UN Secretary General aka president of the world! 4. Prof. Allotey and his mathematical genius discoverer of the “Allotey Formalism” whatever that means. It really is a BIG thing in mathematics and he is renowned the world over. 5. Yaa Asantewaa – we really should have her in the same light as any of the greatest freedom fighters like Patrick Henry, Che Guevara and others. 6. Alhaji Abdul Aziz Brimah – of the 81st West African Division (Gold Coast) a little known soldier who saw battle in Burma, fighting for King and country (and colony). Daring and brave, we too can brag of our “few” who helped win the 2nd World War. 7.OSIBISA – The BEST live band of the Seventies. The original Afro-Funk fusion band. Wowed audiences from Australia to the US and all the countries in between. Teddy Osei and Mac Tontoh and Kiki Gyan and Kofi Ayivor. Musical geniuses all! 8. Kweku Ananse – Lovable rogue, who inspired the Brer Rabbit stories. Anansekrom, anyone? Would be a big as any Disneyworld! 9. Ozwald Boateng – can’t afford his suits right now, but Samuel L. Jackson and Will Smith can, and they might to jam/act with Oz in Cape Coast. Maybe, if we made enough noise about it. ← I got to work: SCRAP SHORT TERM TOURIST VISAS TO GHANA for jobs!